Cake is one of my favorite desserts, but, sometimes, I don’t have the patience to bake one from scratch. I want a piping hot, fresh, and delicious cake RIGHT NOW! 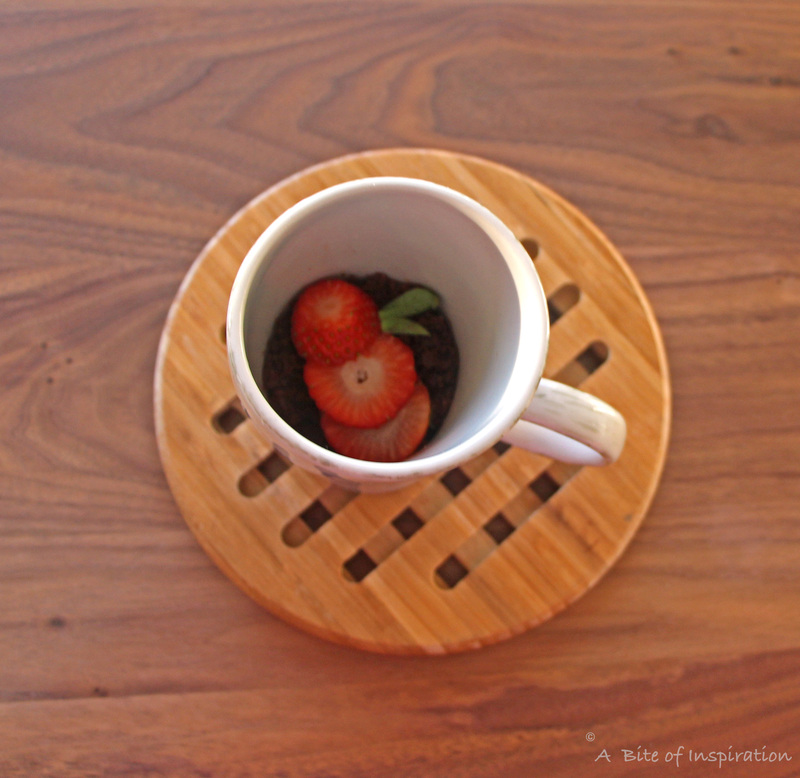 Lucky for me, mircowave mug cake exists and allows me to have instant chocolate gratification anytime I want! My version is gluten-free and vegan, which makes it a bit more guilt-free! Go ahead and have one… or two! Easy-to-make and incredibly delicious! My fiancé, Mateo, is a HUGE Star Wars fan. He’s seen all the films multiple times, knows all the random trivia, and gets really, super excited every time a new movie comes out. I, on the other hand, am one of those people who has watched all the movies one time each and enjoys them, but doesn’t really retain that much of it. I pretty much watch every film like a standalone movie because I can’t really keep track of what came before or after it. So, anyway, we saw the newest movie, Star Wars: Rogue One, a few weeks ago and, this time, something did stick with me! THAT LAST SCENE—yeah, that one. The one everyone is talking about. Constantly. The one where (spoiler alert!) Darth Vader steps out of the darkness, his bright red lightsaber humming, destroying everyone in his path. It was a breathtaking and terrifying manifestation of pure evil. The dark side in its rawest form. As you probably know by now, when something has a strong effect on me, it tends to turn into inspiration for a new recipe. This is no different. 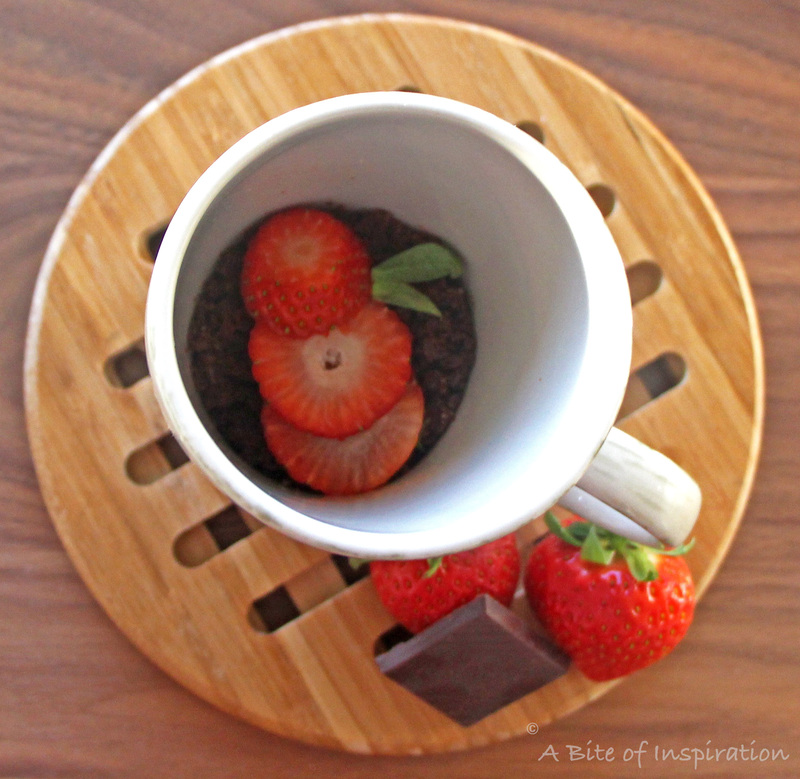 Inspired by Darth Vader and his bright red lightsaber, I have created a deep, dark chocolate mug cake topped with strawberries. The dark chocolate, as you can probably guess, is symbolic of Darth Vader himself and his embodiment of the Dark Side. The bright red strawberries are his glowing lightsaber. Just like that epic ending scene that surprised Star Wars fans everywhere, my mug cake contains a surprise of its very own: a dark chocolate molten center! It’s also vegan and gluten-free because… well, um… Darth Vader likes his desserts on the healthier side? Okay, so the tie-in with the film ends with the dark chocolate, the strawberries, and the molten chocolate, but you have to admit I was on a roll there, for a while. I love a traditional cake baked in an oven as much as anyone else, but there are some days when I just want dessert and I want it NOW! I don’t want to wait 45 minutes or more for a cake to come out of the oven. I need some instant chocolate gratification. This is where microwave cakes come in. I personally think that microwave cakes are one of the most genius inventions of the new millennium. They are just such a smart idea! You throw a few ingredients into a mug and in a matter of minutes, you can get a freshly “baked”, piping hot cake for one. Who can say no to that? There are lots of renditions of microwave mug cakes out there, but mine happens to be gluten-free AND vegan. This was not an easy feat. It took many tries to get the flavor and texture just right, but I really think that I nailed it. I used coconut flour as the base, as well as coconut oil. These two ingredients add a subtle coconut flavor throughout the cake, which complements that dark chocolate perfectly. I used raw blue agave as my sweetener and almond milk. Feel free to sub the blue agave with regular sugar, but keep in mind that agave is actually sweeter than sugar so you may need a bit more. You can also use any other non-dairy milk—coconut milk would be great, I just happened to have almond milk on hand. I also added a small amount of baking powder. Please note: Baking powder tends to have a small amount of starch in it. In standard U.S. baking powders, it’s usually corn starch, but I’ve heard that in Europe, other types of starch may be used. If you have a gluten-sensitivity, please please PLEASE check the label of your baking powder and make sure you are not using one that contains any gluten. The prep work for this cake is beyond easy. You grab a microwave-safe mug (ceramic ones usually work well), add the dry ingredients then the wet ones, and pop it in the microwave for two minutes. When it comes out, it’ll be bubbly and the oil will have risen to the top. Don’t be alarmed—once it cools a bit, the texture will stabilize. Now, comes the fun part. Adding a dark chocolate square right into the cake to create that molten center. I personally think that Valrhona makes the best chocolate in the entire world. They are a French chocolate manufacturer based in a small town in France. Their chocolate is used by high-end restaurants all over the world. The flavor of their chocolate, especially the darker varieties, is unparalleled in taste—deep, rich, and sweet with a subtle touch of bitterness. Perfection! I used a Valrhona Noir Guanaja 70 percent cacao chocolate square in my cake. If you’re interested, you can purchase an assortment of their chocolates here (vegans take note: the assortment does contain milk chocolate) or just the Noir Guanaja squares used for this cake here . All Valrhona chocolates are considered gluten-free. They are also vegan based in their ingredients, but they are NOT certified vegan! I’m not a vegan, so their chocolates work fine for my purposes. If you are a serious vegan, you should seek out certified vegan chocolate squares for this recipe. Any chocolate square you choose will work well, I just really like Valrhona! I carefully place my dark chocolate square between the tines of a fork (see picture above the previous paragraph) and slip it in the center of the cake as soon as it’s removed from the microwave. The chocolate square melts into the hot cake and creates a gooey, chocolate-y center. After the cake cools for a minute or two, I top it with the strawberry slices and it’s ready to eat! Place the coconut flour, cocoa powder, baking powder, and salt into a microwave safe mug. Mix thoroughly. Add the agave, almond milk, and melted coconut oil in with the dry ingredients. Stir well until the batter is smooth. Place the mug in the microwave and cook for 2 minutes. While the cake is cooking, place the dark chocolate square between the tines of a fork (see picture in post). Carefully remove the mug from the microwave (it will be hot!). Stick the fork with the chocolate square gently into the center of the cake. Once the chocolate square is firmly inside the cake, remove the fork. Allow to sit for 1-2 minutes, so the chocolate can melt and the cake can start to cool. Arrange strawberry slices on top of the cake. Enjoy! Coconut oil is a solid, so in order to make sure it can be easily mixed into the cake batter, put it in a microwave safe dish and melt it for about 10-15 seconds before adding it to the mug. Baking powder contains a starch—usually, cornstarch, which is gluten-free. However, if you have a gluten sensitivity always check that your baking powder does not have any gluten-containing ingredients, just to be safe! For a nut-free cake, replace the almond milk with coconut milk. Thank you, Elizabeth!! Yes, it’s definitely super easy to make! It’s my go-to dessert when I’m too lazy to make anything complicated (which is 99 percent of the time!) Thanks for stopping by! Thank you so much Romain! And you have to watch it ASAP– it’s soo good! Wow! Never thought there’d be a recipe for a delicious chocolate cake ready in five minutes, definitely saving this one! Thank you so much Erica!! 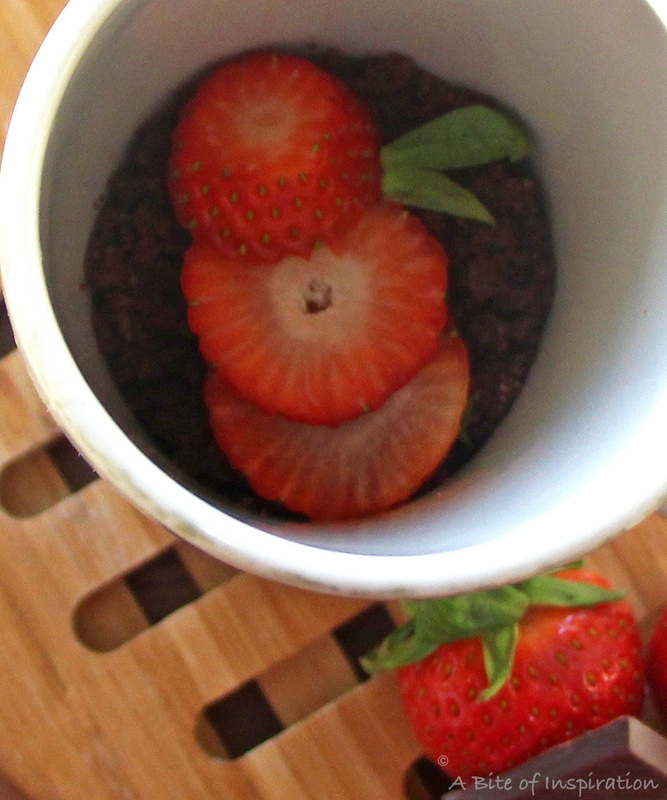 This quick cake is definitely a lifesaver for me on lazy days when I need a chocolate boost! I’m a huge chocoholic! HUGE! Coconut flour smells so fantastic, I bet it would be amazing with chocolate! I bought some coconut flour not too long ago for fun, but I had no idea what to do with it so I stored it in a jar and occasionally take it out to sniff it. (ya I know, I’m a bit odd :)) Now I know what to use it for!